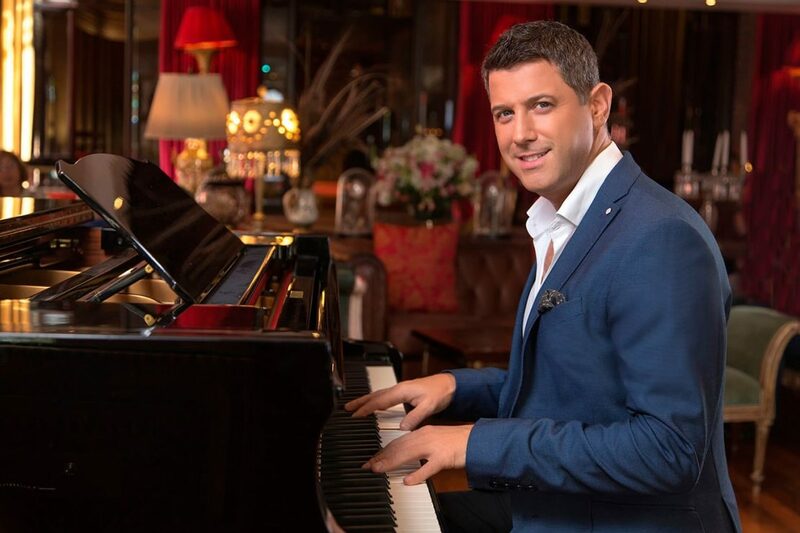 Born in Paris, on March 7, 1973, Sébastien Izambard is a French musician, singer, composer, and record producer, whose recognizable and warm voice is the soul pop of the international group IL Divo. During his adolescence, and in a completely self-taught way, he learned to play the guitar to impress the first girl he fell in love with. Thanks to the guitar, when he was only 17 years old, he started earning money playing on the Seine river boats for couples in love, and later playing piano in Parisian bars as well as singing in karaokes. After recording several mockups with his own compositions, auditioning and visiting several record companies, he finally managed to sign with the record label EMI Music France. Sponsored by the French singer Florent Pagny, he achieved to release his debut album “Libre” on June 6, 2000, at the age of 25, with which he became a new pop star in France, reaching number # 1 in the ranking with the single “Si Tu Savais”. The most important thing in my life are my children, and there have been many times when life has not been very easy for them, and that has made me suffer a lot. There have been concerts in which before leaving I had to endure the tears, but luckily, I have always had my music as a companion, and my colleagues and my dear fans to support me in this beautiful, although sometimes thorny journey that is life. In the year 2001, he was the special guest on the tour of the French legend Johnny Hallyday. In 2002 he collaborated in the musical work of Riccardo Cocciante entitled Le Petit Prince (The Little Prince), an adaptation of the work of Antoine de Saint-Exupéry, playing two roles in the same work; The Businessman and The King at the Paris Casino, represented from February 2002 to October of the same year. After Le Petit Prince also participated in small plays of the theater group La Toupe. While recording his second solo album and after collaborating on “Le Petit Prince”, Sébastien attended an audition for the musical “The Sun King”. While waiting, she met Geraldine Larrosa, artistically known as Innocence, and her then-partner Carlos Marín (currently also a member of IL Divo), who after listening to Sébastien singing in videos on the internet, told her about the audition that was going to be for a new Simon Cowell’s project at the Opera de la Bastille in Paris. His audition Izambard captivated Simon who offered him the position of 4th member in the band, and the rest … is already IL Divo’s story. In the summer of 2011 he participated as a jury in the “Born to Shine” program for the Independent Television (ITV) chain in Great Britain. Despite his records and his tight tours with IL Divo, Sebastien has never stopped composing for him and other international pop artists. So in 2017 he released his second solo singer album entitled “We Came Here To Love”, from which he extracted 3 singles: Kingdom Come, We Came Here To Love and Up. Sebastien is also an active member of the French organization AMTM Assistance Médicale Toit du Monde, and global ambassador of the Sanfilippo Children’s Foundation. In his role as ambassador of the latter organization, in December 2014, he produced the charity album entitled “Bringing Hope for Isla and Jude”, which went on sale on December 5, 2014 with the single written by Kate Bush “This Woman’s Work “with the collaboration of some of the most important Australian artists, among others: Alex Lloyd, Casey Donovan, Christine Anu, Damien Leith, Darren Hayes, David Campbell, Diesel, Ella Hooper, Katy Steele, Marlisa, Natalie Bassingthwaighte, Nathaniel, Pete Murray and The Australian Children’s Choir.